Victor: How long before we are fenced in? HOW long will it be before all the canals and rivers going through cities and towns are fenced-off, and us boaters of course fenced in? Most of us must know about the many drownings in the Rochdale Canal in Manchester, the Avon at Bath and the Ouse at York—there are so many that they make national news. But it was the item that there had been no less than five drowning in the space of three weeks in the Calder at Dewsbury that awoke my interest, with yet another drowning there this month, and if it was not for a local boater telling us about it, it would have passed without notice, for It was not of national interest. So in addition to trawling narrowboatworld, and able to go back past the normal limit of 50 articles, I spend no few hours on the internet, and the result was alarming as I totalled 403 people had drowned in the navigable waterways within five years! I soon discovered that many of these were young men who had obviously had too much to drink staggering out of pubs and clubs in the early hours of the morning, and all too often resulting in the well known call to 'fence it off', as the idiots were not capable of looking after themselves. 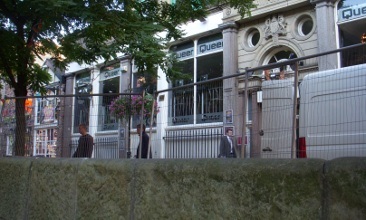 The photograph shows the high fence erected on Canal Street in Manchester to stops the drunks falling into the Rochdale Canal. I often wonder if it is those left behind in so many cases that either had little concern about some one's drinking habits or state of mind that then blame the lack of fencing to cover their own lack of responsibility for the problem. Alas we are now very much in a 'nanny state' where it seems there are too many who believe their safety is not their responsibility, but someone else’s. 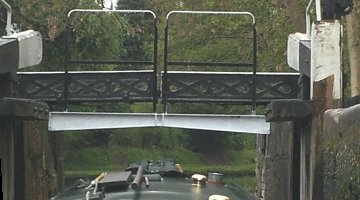 An example was when a young lad rode his bike across one of those narrow lock bridges on the Staffs & Worcs, fell off and drowned. The result was that bridge and the rest had to have fencing along them to stop it happening again. (As David Hymer's photograph shows.) Yet whose fault was it? Eventually, as more people lose their lives in our waterways, particularly in the cities, we really will be fenced in.